Florida may be best known for being the home of the Walt Disney World Resort and Universal Studios theme parks, along with a long list of other major attractions that draw in tens of millions of visitors each and every year, but the natural side of the Sunshine State also has a lot to offer. Between mangroves, barrier islands, the Florida Keys, the Everglades, and other exciting natural areas, there’s a lot of diverse wilderness to explore all around the state, and Florida also boasts some of the finest beaches in all of North America. Everyone will have their own views on the best beaches in Florida. 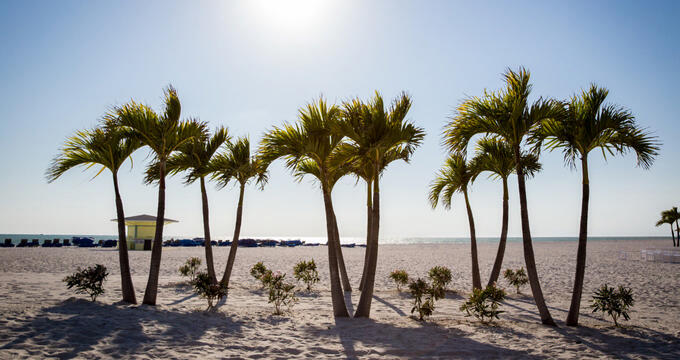 Some will prefer the shores down by Miami on the Atlantic Coast, while others will favor the powdery white sands at locations like Clearwater on the Gulf Coast. The truth is that Florida has an exceptionally long list of awe-inspiring beaches for everyone to enjoy, and almost all of the state’s major coastal cities have their own selection of super shoreline locations, including St Petersburg. Often known by locals at St. Pete, this Gulf Coast city is located in Pinellas County. With some of the whitest sands and warmest waters around, along with plenty of barrier islands to visit, St Petersburg beaches are simply breathtaking. St Petersburg is home to some of Florida’s finest and prettiest beaches. There are at least a dozen world class beach locations to be found in the city and surrounding area, so it can be quite hard to choose between them. We're here to help, providing brief breakdowns and key details on each beach to help you decide which one to visit first. Read on to learn all about them. A world-famous beach that almost everyone has heard of, Clearwater has been consistently classed as one of the best beaches not just in Florida, but in all of America. It was named for the shimmering clear waters right off the shore, and it's almost impossible to resist going for a dip at this St Petersburg beach. The sands are simply perfect too, being exceptionally white and cool as you let your feet sink into them. The local area is nicely built-up with good quality restaurants and a Beach Walk area with stores and nightlife spaces. In short, there's a lot to love about Clearwater and it's a must-visit location for any beach enthusiasts in the Sunshine State. No mention of St Petersburg beaches can be complete without St Pete Beach itself. This is the main beach of the city and a big hit with both locals and tourists in the area. St Pete Beach runs for several miles and is a hugely popular spot for surfing, paddleboarding, swimming, and other water-based activities. It's also been ranked as one of the best American beaches by several prestigious vacation experts and companies. The great thing about St Pete Beach is all the amenities of the city right nearby like hotels, eateries, bars, and more, so you can have a full day of fun here without needing to worry about anything. Stretching out for over 4,000 feet, Belleair Beach is a far cry from Clearwater in terms of crowds and popularity, but it's arguably just as beautiful. It's a quiet beach and a perfect pick for people who just want to sit back and feel like they've set foot on an almost-private island. The views out to the Gulf waters are breathtaking and the sands are among the softest you'll ever hope to find. Millionaire's mansions line the seafront, giving an exclusive, elegant atmosphere to this secluded space, but there aren't any amenities or concessions, so you'll have to bring your own food and beach gear. Often ranked as one of the best beaches in all of Florida, Caladesi Island is another barrier island near St Petersburg. It's only accessible by boat, but it's definitely worth the trip, with pristine powdery sand and lots of useful amenities like concessions, showers, a rental shop, grills, changing areas, and more. The views from this location are simply astonishing and it's a super spot to fire up the grill and enjoy a BBQ with family or friends. Kayaking is especially popular around this area too, with various guided tours exploring the nearby islands. Technically classed as the Honeymoon Island State Park, this is a barrier island that covers almost 400 acres in total, including around four miles of stunning sandy beaches. It's one of the northernmost beaches in the St Petersburg area but is well worth a visit, especially for nature enthusiasts and keen wildlife spotters. Lots of different bird species can be spotted around the island and there are some super nature trails to hike along. The beaches themselves are warm and welcoming, with a nice Gulf Coast breeze to cool you down on the hottest of days. Dogs are welcome at one of the Honeymoon Island beaches too, and there are lots of activities to enjoy here like kayaking, swimming, and sunbathing. Not far from St Petersburg is North Redington Beach. Boasting white, silky smooth sands and shimmering waters, this is another of Florida's best Gulf Coast beaches. There's a huge fishing pier here which is a lovely spot to walk along and admire the sunset in the evenings, and the beach itself is ideal for sunbathing, reading, and simply relaxing with friends and loved ones. It's a very large, wide beach with a lot of space, so you'll never feel crowded out at North Redington Beach, even on the busiest of days.